Stuffed cabbage rolls made easy. 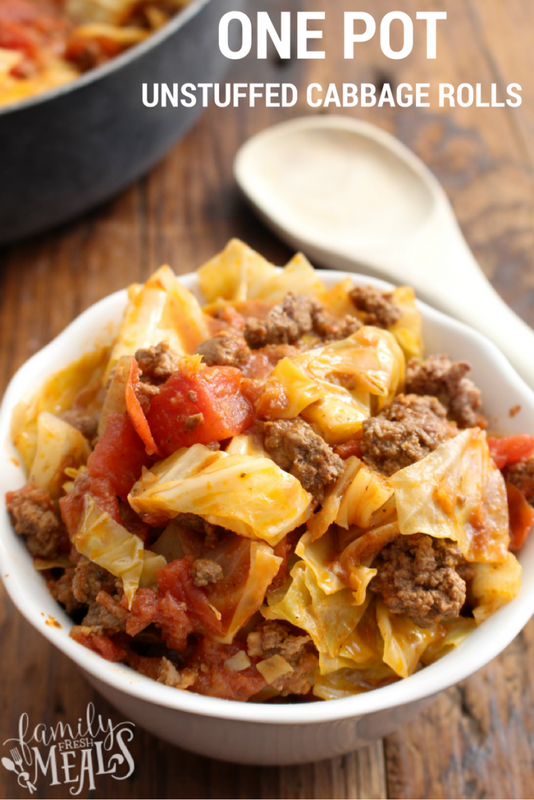 Stuffed cabbage is a delicious traditional dish from eastern Europe. 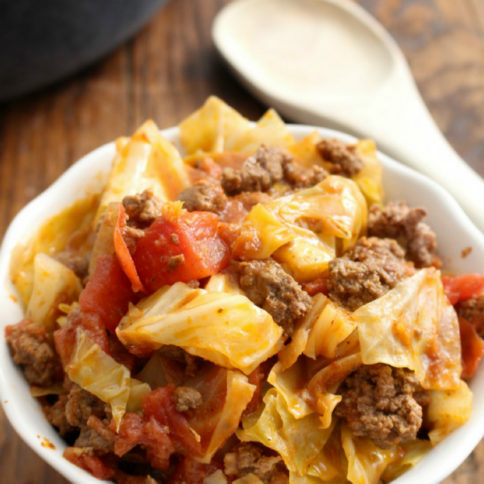 There are lots of ways to make it, but the most familiar way is to mix ground beef with onion, garlic, and cooked rice, wrap this filling in boiled cabbage leaves, cover it with tomato sauce, and bake it in a casserole dish. The juices from the meat ooze out into the rice and blend with the tomato sauce to make a yummy, hearty, savory meal. Unfortunately, making it this way is a big hassle. You have to cook the cabbage first, and then mix up the filling, and then load it into the cabbage leaves and roll them up and put them in the dish and spoon on the tomato sauce…and then wait 45 minutes for the whole thing to cook. So I decided it was time to give this complicated dish a makeover. 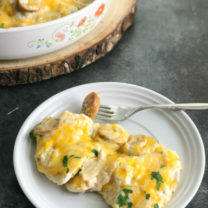 Just like my Easy Crockpot Lasagna Ravioli and my Chicken Cordon Bleu Bites, these One Pot Unstuffed Cabbage Rolls have all the flavor of the original recipe, but they’re way easier to make. No need to mess with boiling and stuffing and rolling up a bunch of cabbage leaves…just brown the meat, add the rest of the ingredients, and let it all simmer in one pot until it’s done. 1. 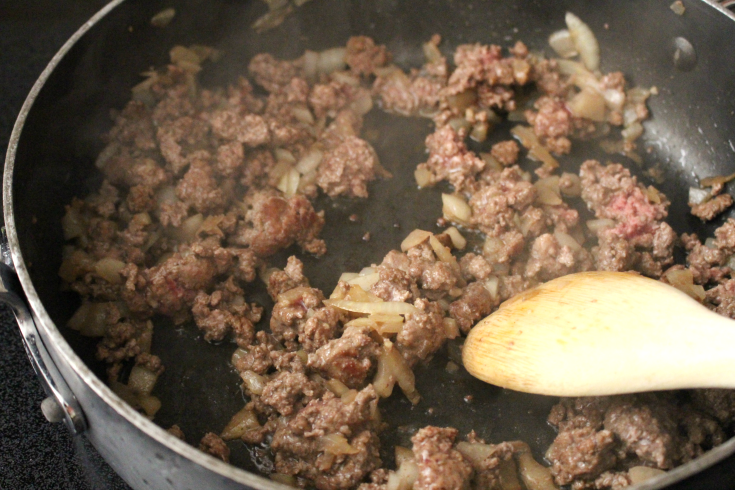 In a large, deep skillet or dutch oven, brown ground beef, onions and garlic together. Cook until browned and crumbly, 5 to 7 minutes; drain and discard grease. 2. Add cabbage, tomatoes, tomato sauce, broth, paprika, sugar, salt, and pepper and bring to a boil. 3. 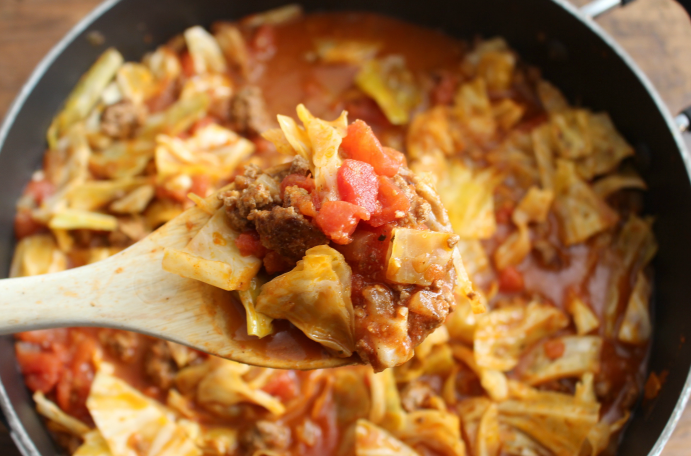 Cover and reduce heat, and simmer until cabbage is tender, about 30 minutes. Enjoy as is, or serve over rice. 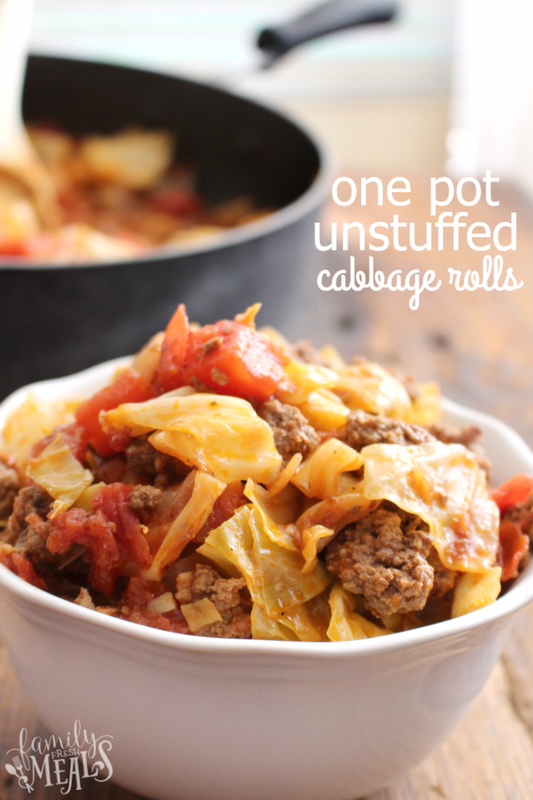 These One Pot Unstuffed Cabbage Rolls tastes just like Grandma’s...but without all the work. 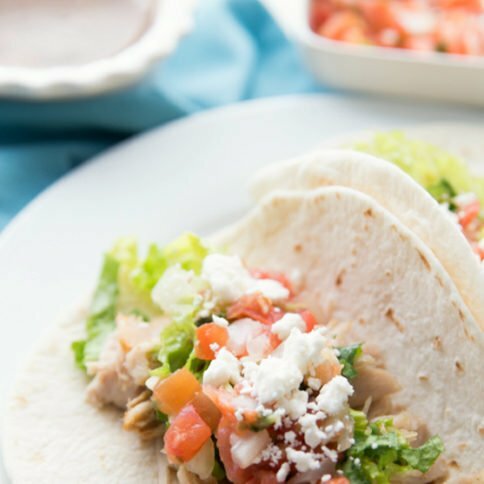 Whip this yummy dish up in about 30 minutes. In a large, deep skillet or dutch oven, brown ground beef, onions and garlic together. Cook until browned and crumbly, 5 to 7 minutes; drain and discard grease. Add cabbage, tomatoes, tomato sauce, broth, paprika, sugar, salt, and pepper and bring to a boil. 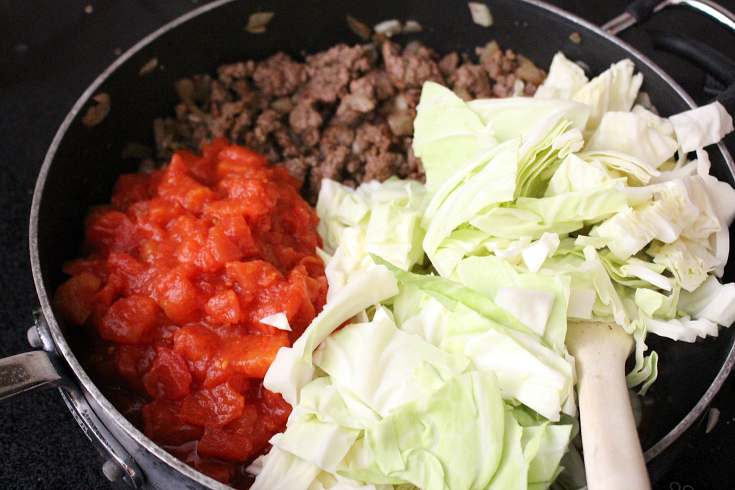 Cover and reduce heat, and simmer until cabbage is tender, about 30 minutes. Hi Corey. This looks so good, easy, and simple. 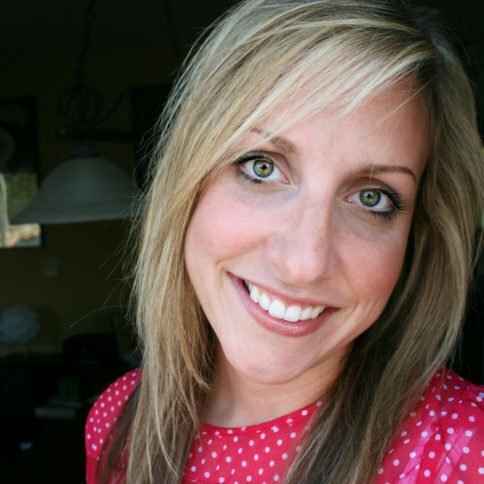 Thank you for your great recipes. I just have a quick question regarding the amount of broth. I assume it’s about 1/2 c but you may have meant something else? Yes I am so sorry the “cup” got cut off 🙂 It should be 1/2 cup 🙂 I will correct that now. The recipe calls for tomato sauce but the video says paste, which is it? Where’s the rice? I ‘ve made cabbage rolls not stuffed for years. My mother took the time to stuff them. I can’t be bothered lol She also added a bit of bacon too. I will try your recipe and will add rice. Thanks. I also put rice in my stuffed cabbage, so I’m wondering how to incorporate it in the unstuffed cabbage. Would you add cooked or uncooked rice and just add extra liquid? I would imagine that you just serve it over rice if that’s what you’d like. That’s what we do. Tastes great! I just made this tonight! It’s so good! Except I had to cook mine closer to 90 min instead of 30 to soften the cabbage. Also, I made rice and then once the cabbage was cooked, I added all the rice to the pot and mixed it all together! Love this recipe. I used ground turkey instead. I had tomato paste instead of sauce, so I had to make my own sauce. I think I added a little bit too much of the tomato sauce but I decided to add a little more cabbage. I also added rice! This looks awesome! Question or your thoughts. I have jars of homemade sauerkraut … Could I use that in this soup? Or does it have to be made with fresh cabbage? Will be making this soon. What is the unit of measure for the broth… 1/2 broth…? I suspect 1/2 cup but just needed to confirm. How much beef broth? It just says 1/2 beef broth. Is that supposed to be cup or box? Nope. At the end of the post, I suggested that you could serve over rice, but if you are looking for a more low carb meal, just enjoy as is 🙂 I hope that helps Ellen. I just made this for my elderly mom and dad. Not only is this inexpensive but so darn delicious! i made some rice with the left over beef broth and it completed the meal! I will be making this once a week . I give it 5 stars! Added 2 more cups of beef broth and a cup of uncooked rice and it came out amazing! will be keeping this recipe handy. Do you think this would freeze well for later? 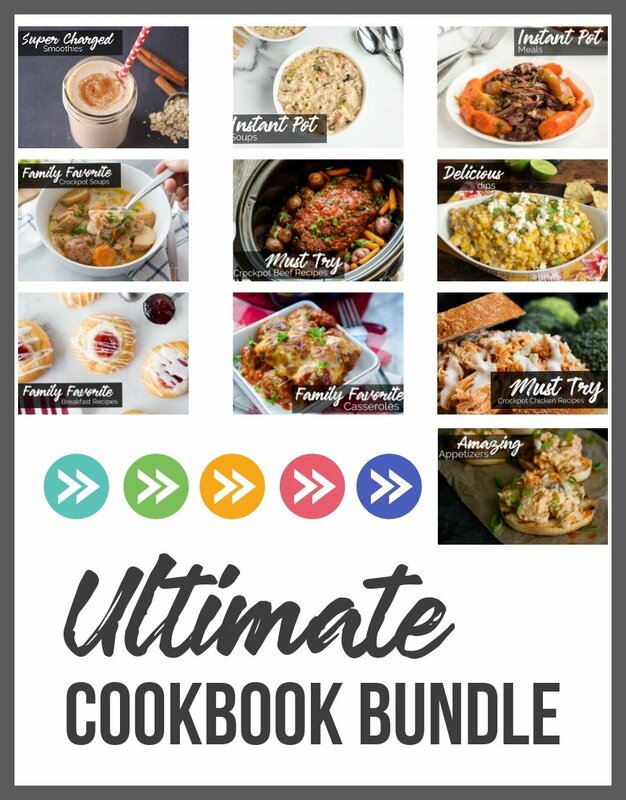 Looking for some make ahead meals for my return to work. Yes! I freeze single portions all the time! I have made this many times. Big hit. I even added a cup of uncooked rice when making it. Love the soup recipe too. Sometimes cross the too. Add the Worchester sauce to the unstuffed cabbage rolls. Like the taste it gives. Kathy, How long did you cook in crock pot? Not the biggest fan of tomatoes. Replaced one can of diced with more broth. Delicious over rice!! I found this recipe today, and have it cooking right now….smells awesome…. Just made this. It is very good and the kids love it too. 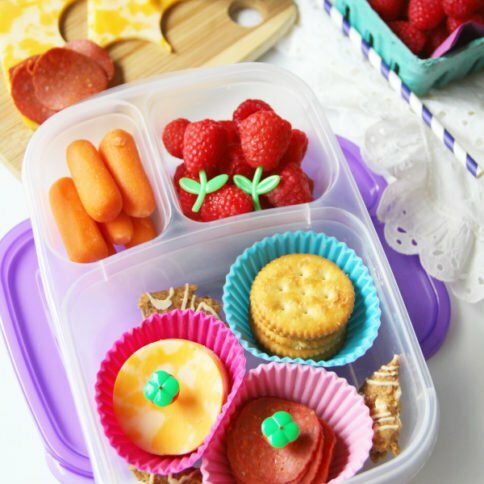 Very easy to make!! Thank you. If I plan to cook this in a crockpot, how long should I cook it for? High or low? Since you have an ad for Young Living Essential Oils on your page, I have to assume you use them; why do you not add them to your recipes? I know not everyone coming to your site uses them but those of us who do, would enjoying seeing how to add them. 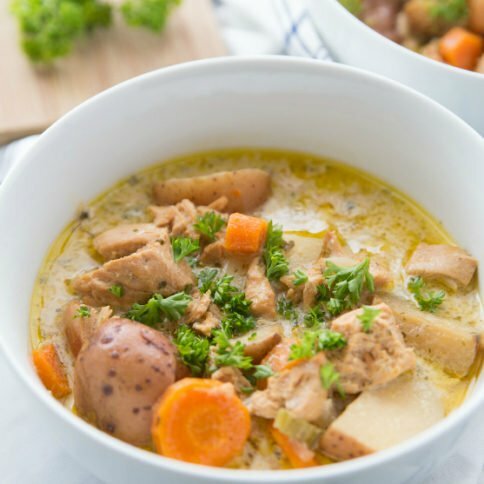 Could this be made in a instant pot and if so what would the timings be. This was delicious! Have you ever made it with ground turkey? If so, would you still use beef stock or is that weird? I think beef stock would work fine. 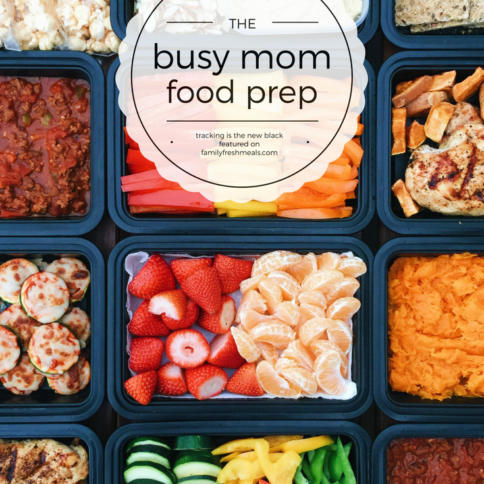 I have not used ground turkey yet, but I bet it would turn out awesome! I don’t ever use ground beef…I use ground turkey. I used the beef broth also. It was delicious! Will make again …. Thanks for the recipe! So delicious!! I used ground turkey and chicken stock because I had no beef. Will definitely be one of my go to meals!!! used leftover rice ) and it came out great. I am making this now but with ground pork. Seems more fitting with a cabbage dish. I thought two cans of tomatoes was too much so I just used one but I added more cabbage. I have pasta cooking in additional beef broth for flavor and it smells amazing! Holy cow! I can not cook at all but this was so amazingly easy! Do you know what the calorie count is per a serving? Do I drain the dice tomatoes? 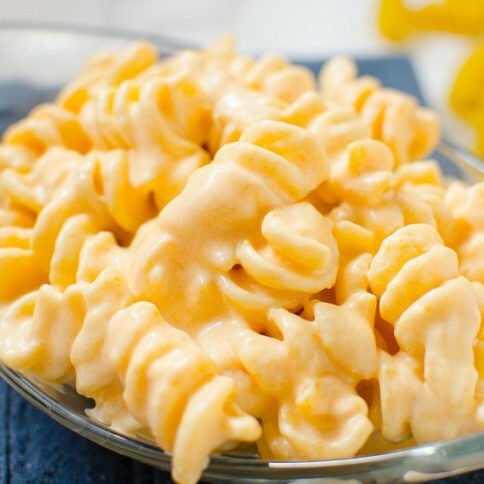 I’m making this for dinner tomorrow. My family lives your recipes. I made the cheesy ham and potato casserole today! They LOVED it. No, do not drain tomatoes. My mom is Eastern European, so I grew up enjoying ‘authentic’ stuffed cabbage (Golabki) probably once a month. I made this (easy) recipe, and it lacked a LOT of flavor. Also, where is the rice, which is always mixed in with the meat filling? I’d rather take the extra time to make Stuffed Cabbage the ‘original way’, instead of taking this short-cut. Sorry, but it was not at all what I expected. Can you leave out the sugar? Yes! I’ve been making this for years and have never used sugar…or broth for that matter. I don’t think it needs it. 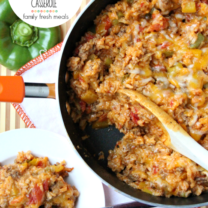 This is a great, simple one pot meal!! I use ground turkey (93% lean) and sub one of the cans of tomatoes for a can of fire roasted tomatoes for a little extra flavor! Kick things up a little with a pinch or two of red pepper flakes, yummy!!! Oooohh, love your idea of using fire roasted tomatoes. Thanks for sharing! Will definitely serve this over rice or brown rice….. The recipe says tomato sauce yet the video says tomato paste? Can you please clarify? It is tomato sauce Diana. Just wondering if you have the nutritional content for this dish?! I already made it and I love it!!! I would like to know carb, protein and calorie count. Has anyone figured it out? How many carbs are in a serving? How much is a serving? We served with jalapeño cornbread sticks. Yum!! Soooo good! Can you please tell me what the calorie count is? 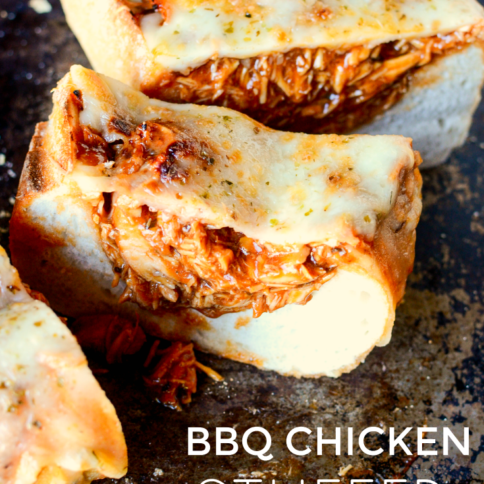 Found this recipe recently, made it and me and my husband were blown away! Thing is, it tasted even better with next day’s leftovers. Next time I will make it ahead of time and let it sit overnight in the fridge. 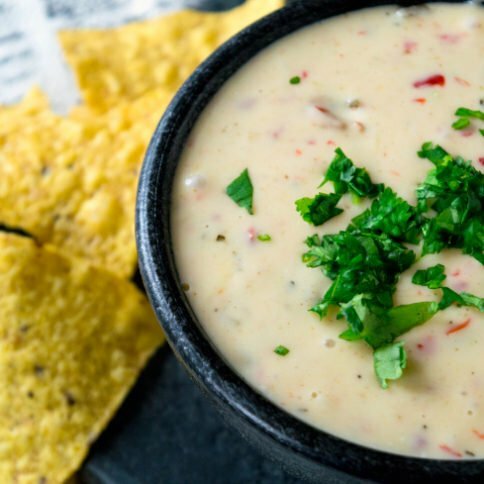 The flavors blend even better (as if that’s possible). Seriously one of my fav all time recipes. Anyone have the nutritional value for this….? ?Would love to find out how many carbs per serving.. I just posted the nutritional analysis. LOVE LOVE LOVE! I used hot Hungarian paprika to give it a kick. 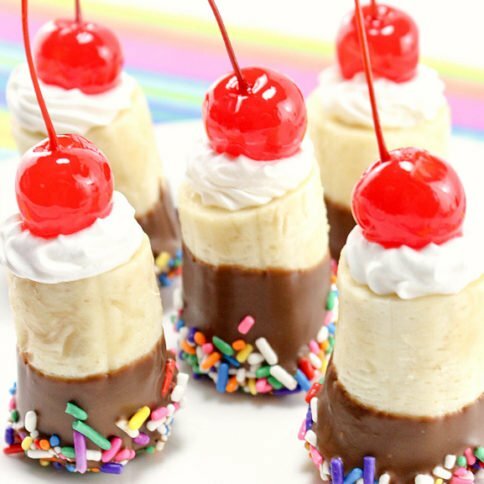 So good that I am making this for our next football party! Thank you Thank you! Craving my grandma’s stuffed cabbage I found this recipe and had to try it. Very good ?? I think my grandma would like the easier recipe. Great recipe! Although I used a cup and half of beef broth to bring a longer boilI will be making this again! Can you please tell me if on a diet would this be something good to eat. Trying to stay low carbs. I would use the ground turkey. Why in the world would you add brown sugar?? I don’t use it in traditional cabbage rolls…. I make it without the broth and sugar. Turns out fine. I just found your recipe for unstuffed cabbage. I can’t wait to try it. I do have one question. I do not keep brown sugar in the house. It is a necessary ingredient for the dish? If it is necessary, but can be substituted? I have only made the dish as written Mary, so I cannot say for sure. You might try just added in some white sugar, or just leaving that out of the recipe. Hey! 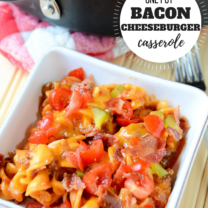 This looks awesome and I’m going to try it in the crock pot! Any suggestions? I already cooked the meat so I’ll add that last as well as a cup of uncooked rice in the beginning! Want to give this a try. How long do you reckon it would take in an Instapot? Ta. Did you add cooked rice at the end or? I did make a few changes I substituted the brown surgery for honey&maple syrup and used turkey burger instead. I added some cooked quinoa at the end and finished it off with a little sour cream. Two thumbs up in our household! Delicious!!! Even my husband and kids loved it! Very easy to make!! Hello, can this be canned? The video shows you use tomato paste. But ingredients list said tomato sauce which is it? This was pretty bland; made it exactly as indicated. Definitely needs something! Like how quick it is but wouldn’t make it again.